The Snake Count is a citizen science program to map and track snake distributions across North America, started by the Center for Snake Conservation. Last spring’s count was so successful and fun, we decided to open up this year’s event to the public! We’ll kick things off Friday evening with an informal viewing and discussion of some of SocialSnakes’ best videos of snake behavior in the wild. Saturday afternoon, when it’s too hot to count snakes, Dr. Erika Nowak will tell us all about relocating rattlesnakes. **Please bring your own food as none will be provided or available for purchase (drinking water is freely available – bring your own bottle). This event is FREE, but please let us know you’re coming by registering below. You can also use this form to be added to our event email list. Email me about upcoming events at Muleshoe! Where is the Muleshoe Ranch Preserve? Not in southern Arizona? 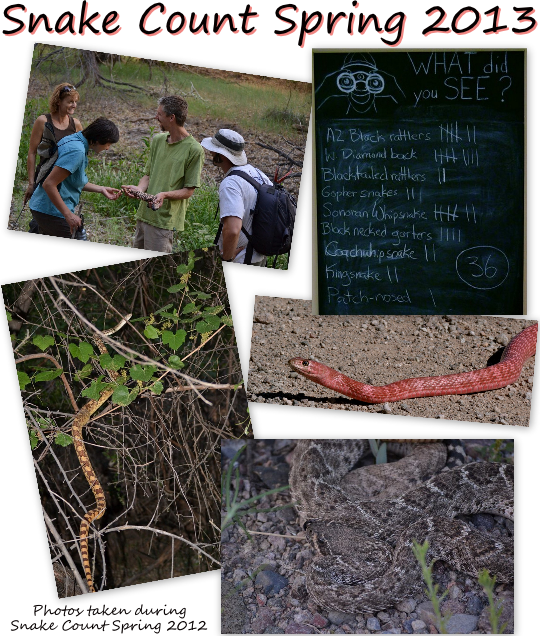 Find out about other Snake Count events by clicking on the image below.